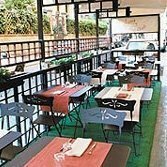 A Parisian trained in the cooking school of la maman opens a restaurant in a city of Romans who dislike French cuisine. Here is wonderful basic French cuisine, kir, vichyssoise, and cream of mushroom. You won’t be able to resist the steak au poivre. And the tarts are the real thing. AC inside. Closed Sunday lunch.